There are certain places I love to eat but don’t visit regularly enough, and I’d say Wagamama is definitely one of those. So when I was asked to sample their new Spring Summer additions to the menu, I jumped at the chance. Plus it seemed like an appropriate way to send off for Cata before her Asian adventure. I’m a huge fan of the food at Wagamama but trips there are always a test of my patience with chopsticks (I’m always determined to try and get through my full meal without using a fork). It’s also a test of my ability to control my food envy when my friend’s dish arrives first; since all of the food is freshly prepared and cooked so just arrives when it’s ready. Which I guess is better than eating something that’s been standing all day! 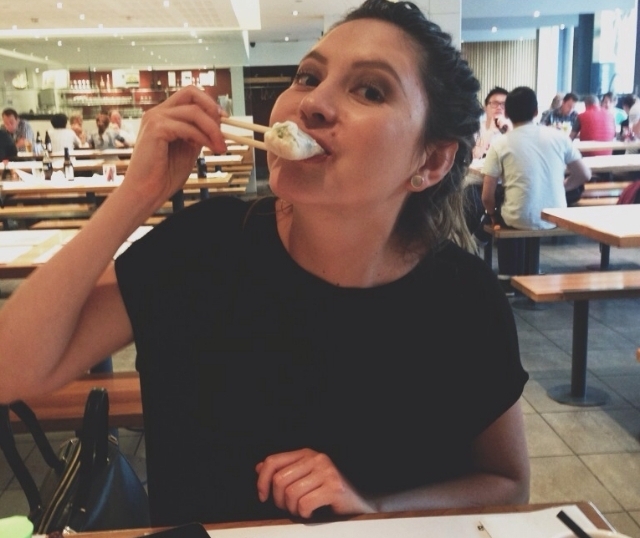 Since Cata was heading off to Asia with work, I thought it was a pretty fitting review to bring her along to and we decided to visit the Eldon Square restaurant straight after work. When we got there, we were greeted by the manager, Nicole, who showed us straight to a table. One thing I’ve always noticed about Wagamama is that no matter how busy the restaurant is, you’re never waiting that long for a table. 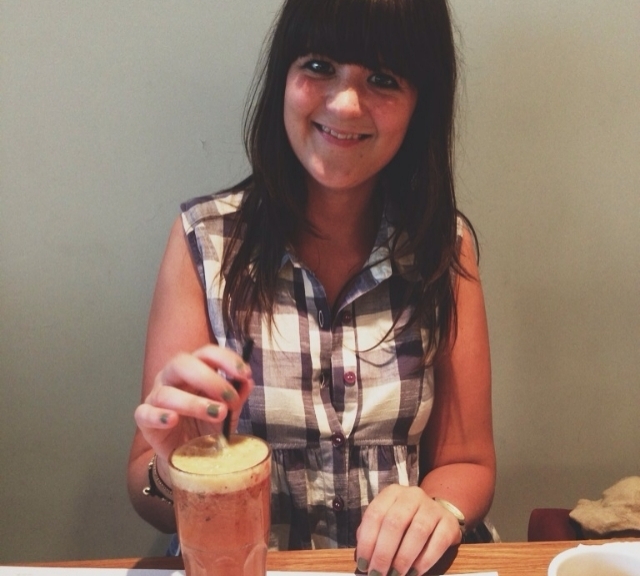 While we perused the menu we ordered green tea and I tried the new strawberry, apple, orange and mint juice. 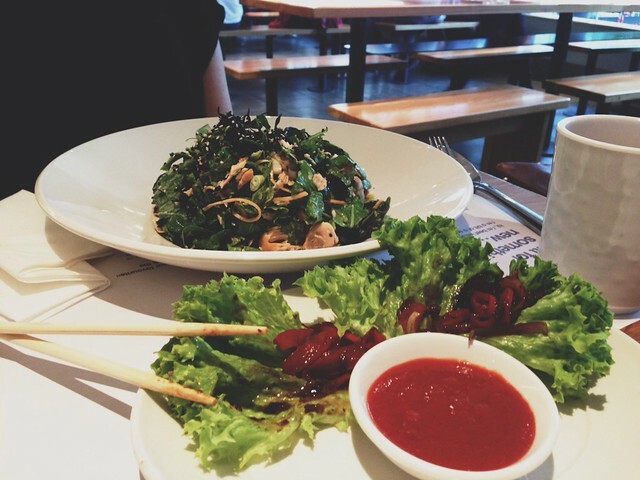 Because we were there to try out the new menu, we only chose from their new additions: opting for beef lettuce wraps and chicken summer rolls to start. For our main courses, I chose the tom yum with prawns and Cata ordered the salmon miso salad. Since we were sharing the starters, it didn’t really matter what order it all arrived in, but the first dish which appeared was the summer rolls. 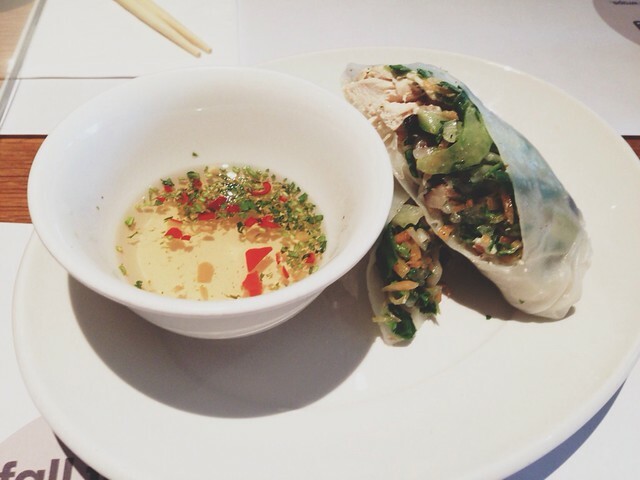 These were miso chicken with wasabi rocket, shredded carrot, cucumber, mushrooms, asparagus, beansprouts, celery, coriander and mooli wrapped in rice paper and accompanied with a dipping sauce made from chilli and corriander, and which to our surprise, are served cold! Although it didn’t stop them being delicious, it wasn’t what I expected and I preferred the beef lettuce wraps. These consisted of slow-cooked shredded beef with red peppers, red onion and chillies served in an amazing Korean barbeque sauce on crisp lettuce leaves. 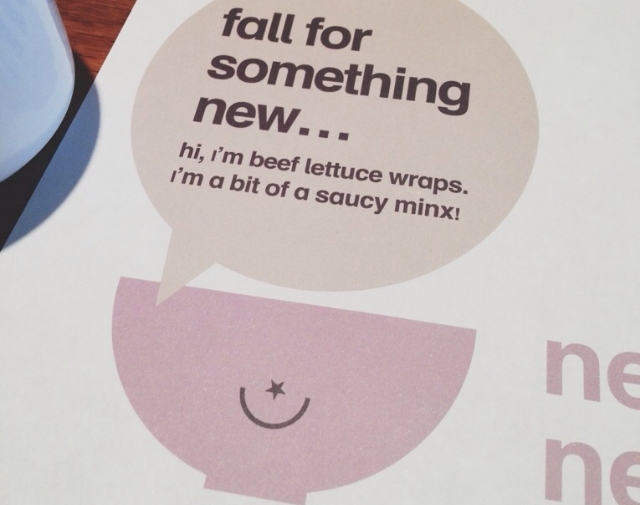 I think next time I would maybe order a portion of the beef lettuce wraps for myself though because they are quite little… possibly for the best though because I’ve never actually managed to finish a meal in Wagamama! Of course this time was no exception since the tom yum is HUGE. A steaming bowl of rice noodles served in a spicy coconut and lemongrass soup topped with stir-fried prawns, courgettes, mushrooms, red onions, spring onions and beansprouts, the tom yum is unreal! Not too spicy, (or too sickly with the coconut), it’s deliciously moreish and ridiculously filling. I think I managed to get through about 2/3 before I had to give up and admit defeat. Cata’s main on the other hand, was a slightly more sensible option since it left her with room for dessert! She tucked into warm flakes of salmon with wasabi rocket, carrot, pea shoots, spring onions and goma wakame seaweed garnished with miso mayonnaise dressing. The salads are still on the same colossal scale that the other dishes are, but since they are mainly leaves it meant she still had room for the passion fruit cheesecake. I was too stuffed to opt for anything other than the ginger and lemon tea and a couple spoonfuls of Cata’s dessert! Wow, lovely pictures and seems to be a great menu for this summer. I really love it. 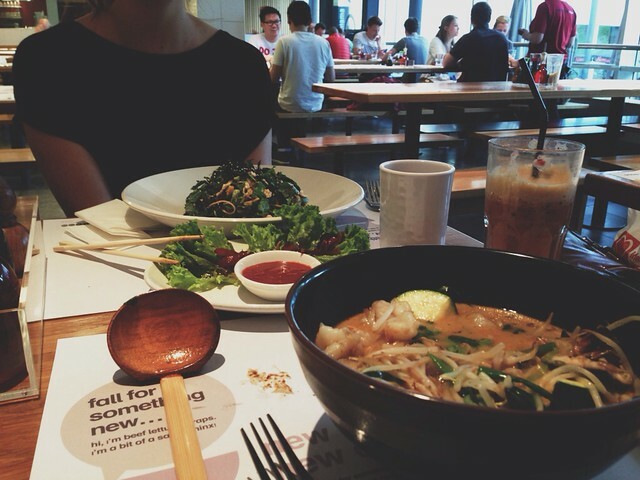 I always stop in at Wagamama when I fly through Terminal 5 at Heathrow airport. There aren't a lot of vegetarian choices but I love their sweet potato curry. And minus the prawns, your tom yum soup sounds just wonderful! Hi!!! So tasty!!! Lovely photos!! !